The team was among 600 other teams that qualified in regional tournaments from around the world. Colerain had been ranked 49th in their division at the end of qualification matches. The team’s chances of moving on looked bleak. However, the tides turned for the team when top ranking teams were scouting for an alliance partner to choose. Colerain’s team, known as R.O.C.K. (Robotic Organization of Cardinals and Knights), showed that their robot was multitalented on the field and could perform many tote stacking tasks to score points. Colerain was chosen to join an alliance with top ranking Team Kika Mana from Hawaii, The Hawaiian Kids, and the Hard Working Hard Hats from West Virginia. 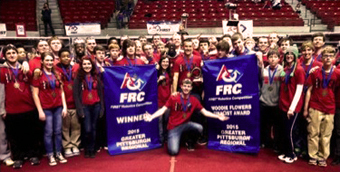 The cooperation and alliance-building is a key part of FIRST Robotics competitions. The team didn’t play in their first match for the alliance, but after the alliance struggled to score enough points in their first match Colerain got their chance to shine. The alliance came back from a large deficit and moved from fifth place to first place after the first round of three during the elimination matches. The alliance went on to win their division and advanced to 6th place at the end of the quarterfinal round on the final elimination field. The team was eliminated by an alliance of teams from Canada, Texas, and New Jersey. The team’s success wouldn’t have been possible without the generous support of Clippard Instrument Laboratory, Butler Tech, and the efforts of the mentors and coaches. The robotics team is an extension of the high school’s engineering design curriculum, which was started at the school back in 2011. The team has had competitive robots before but this is the first time they had been competitive at this worldwide level. The team is looking forward to building on its current success next year. The FIRST® Robotics Competition is a unique varsity Sport for Mind™ designed to help students discover how interesting and rewarding the lives of engineers and scientists can be. It consists of short games played by robots, which are designed and built in six weeks (from a common set of parts) by a team of students and a handful of mentors. The students then program and remotely control the robots in competition rounds on the field.